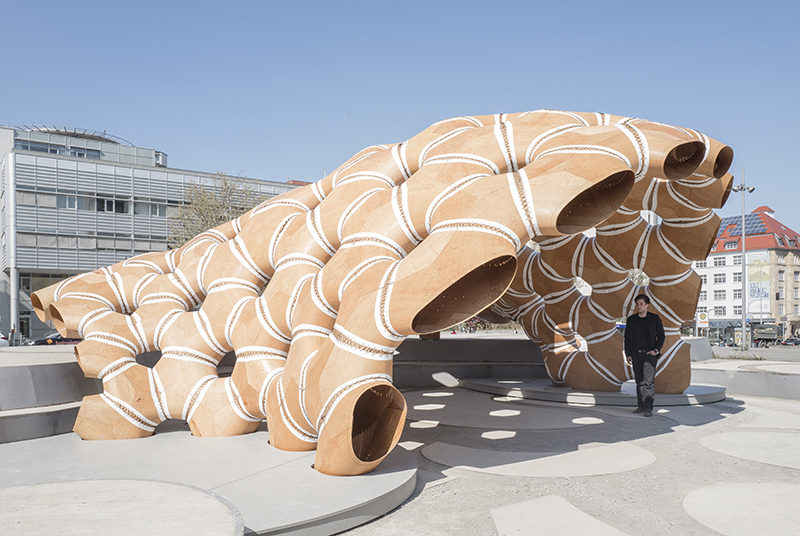 The University of Stuttgart in South West Germany has recently established a history of creating audacious technically-complex pavilions. 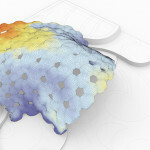 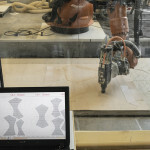 In 2014, the Institute for Computational Design (ICD) and the Institute of Building Structures and Structural Design (ITKE) used robots to weave carbon fiber into the shape of the beetle wings. 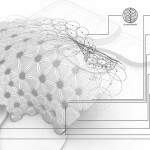 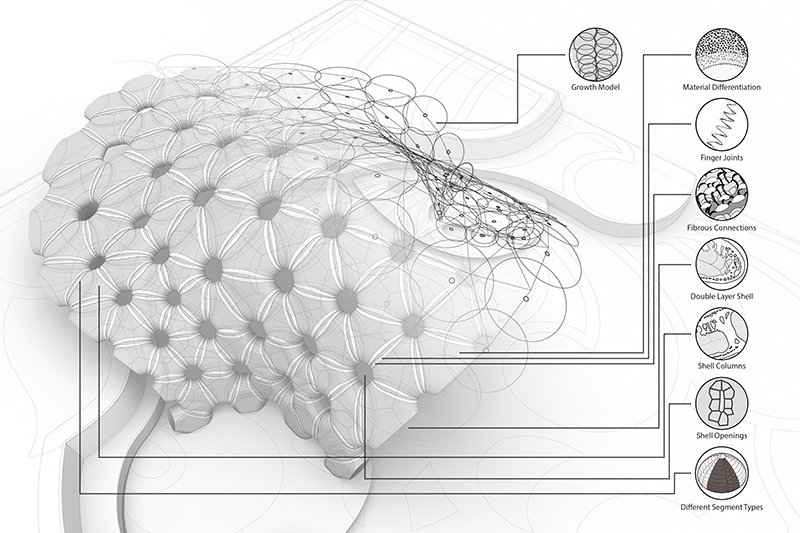 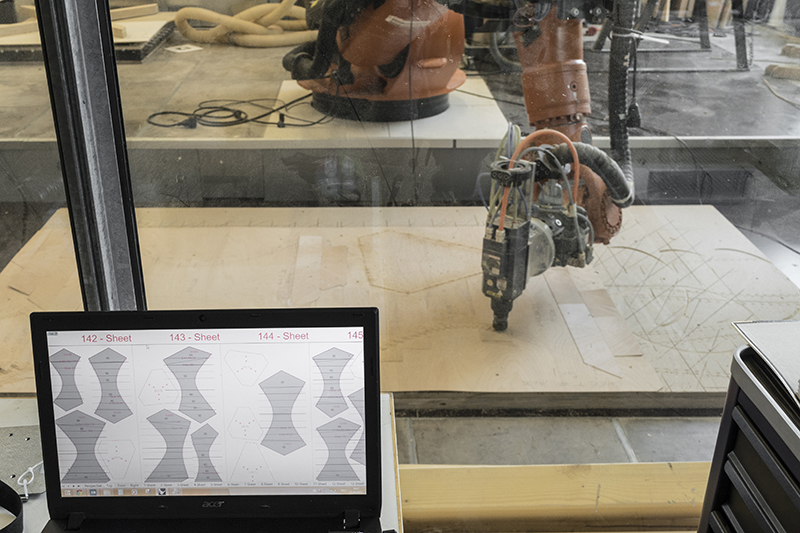 This year, robotics are once again being used by the ICD and ITKE in a similar fashion, drawing on more forms found in nature. 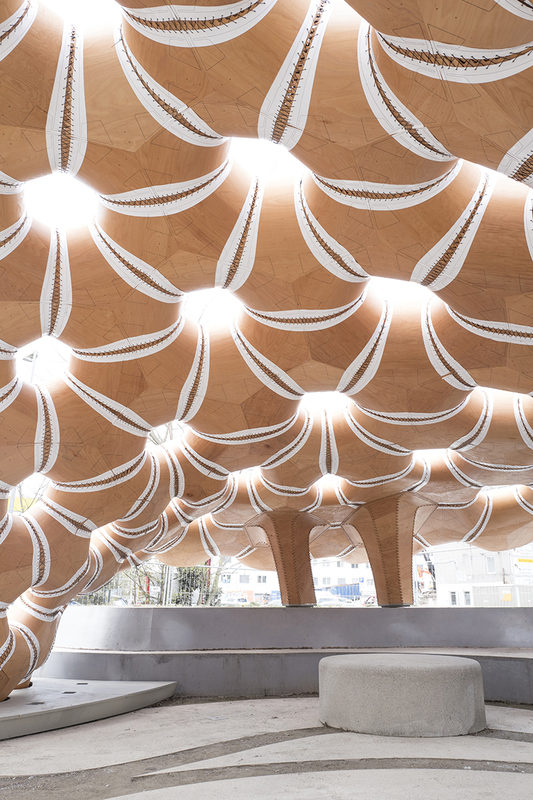 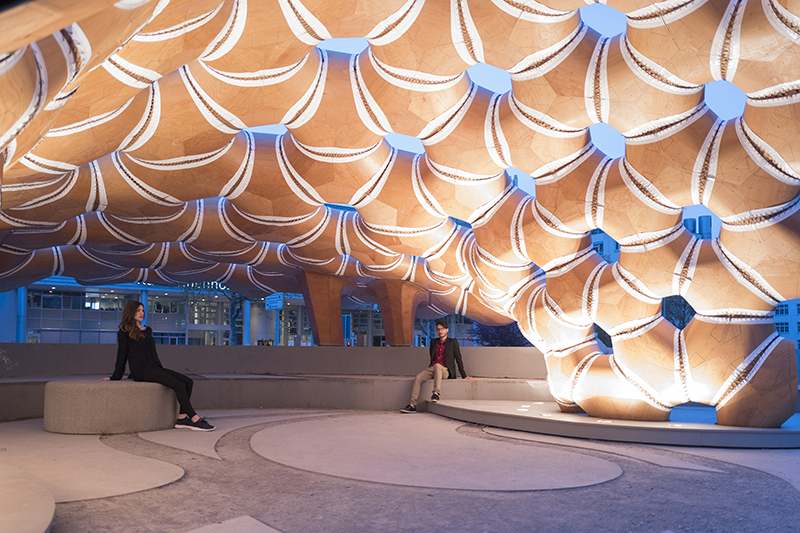 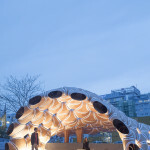 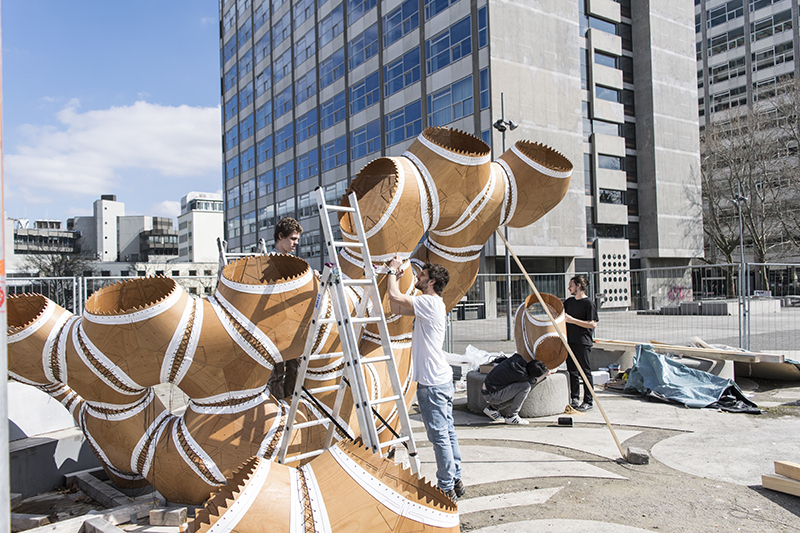 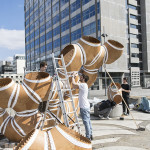 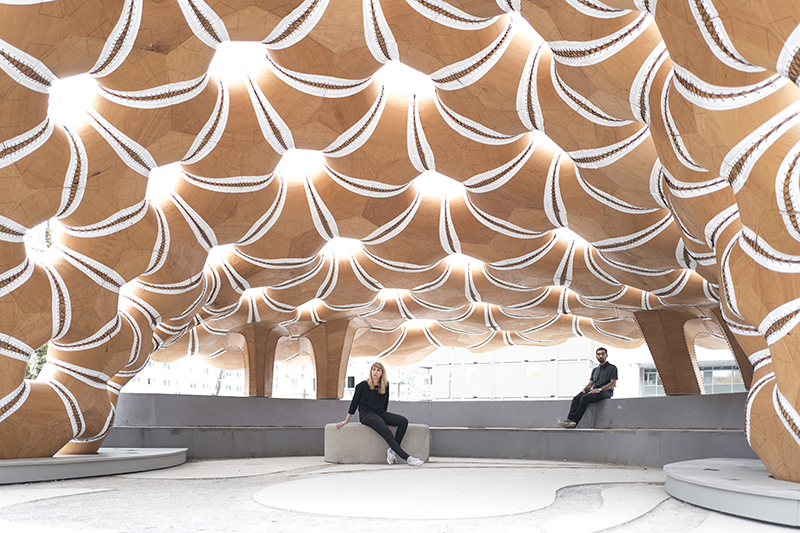 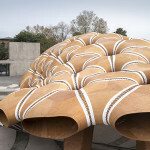 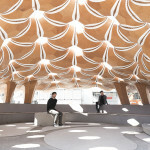 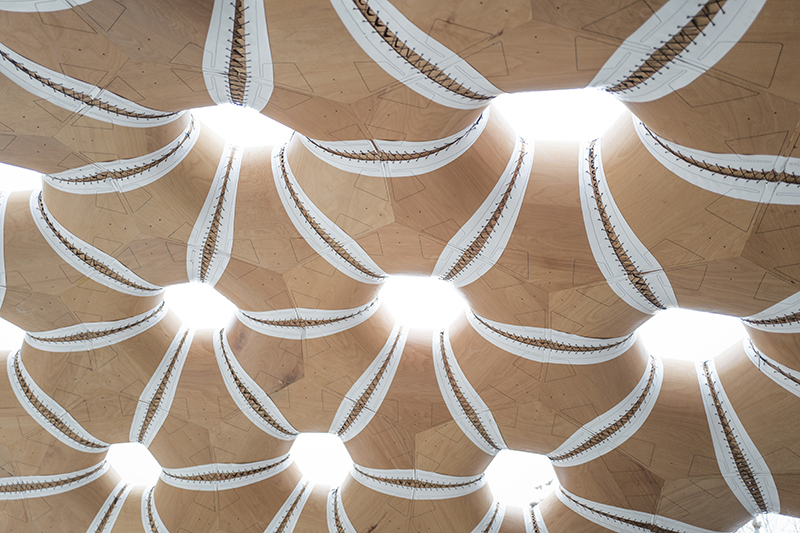 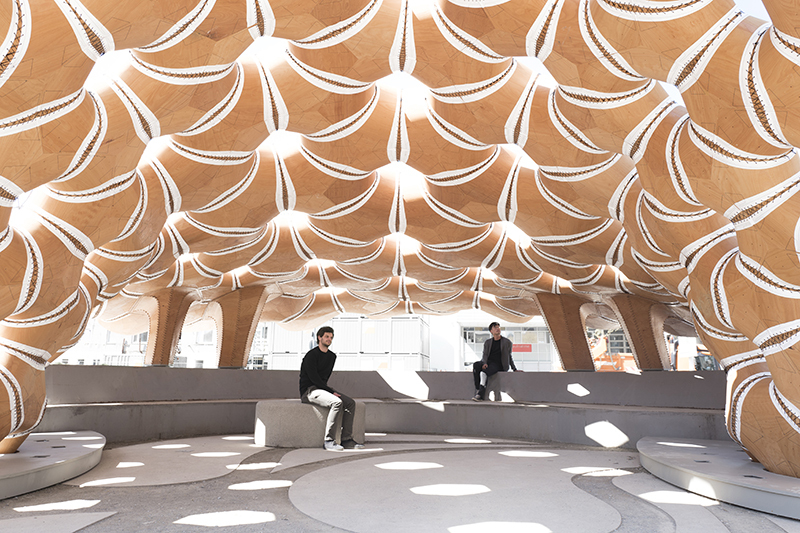 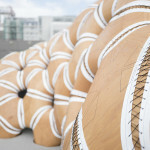 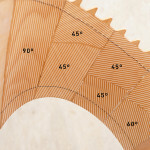 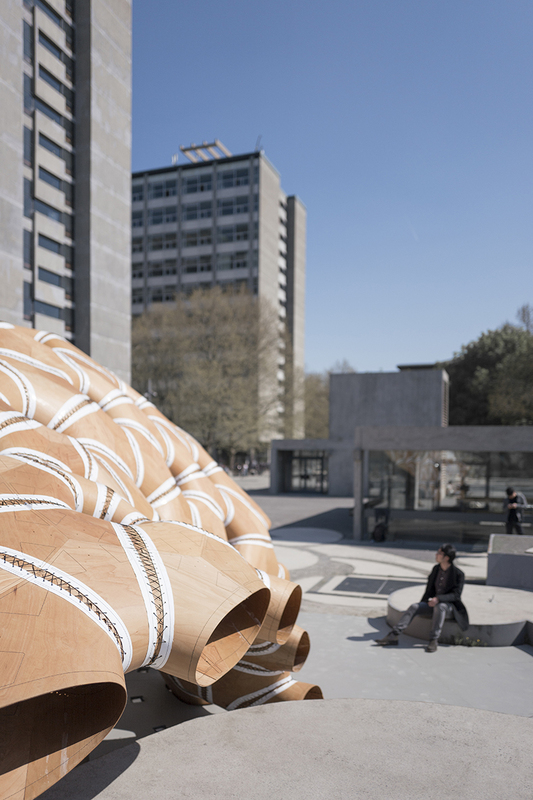 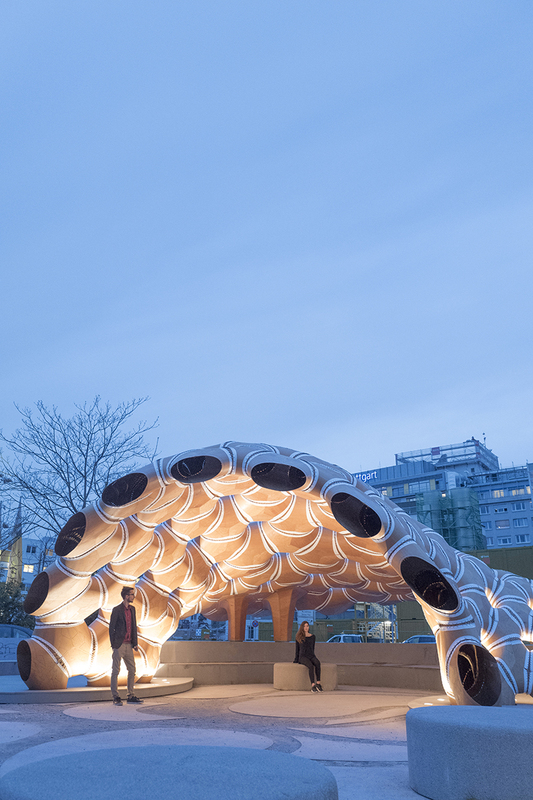 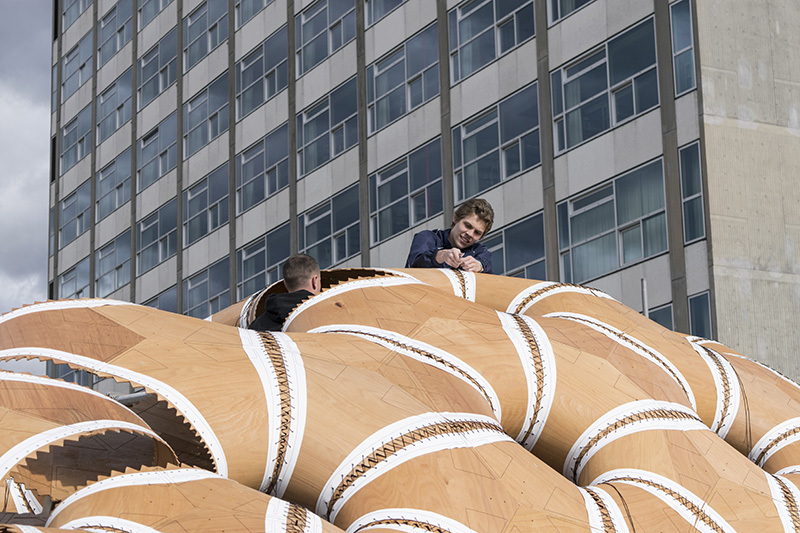 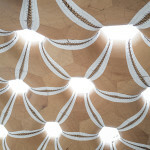 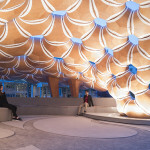 Sewing together 151 plywood shell segments, inspired by sea urchins, the pavilion is the “first of its kind” to make use the industrial sewing of wood at an “architectural scale,” rising 29 feet and weighing just over 1,700 pounds. 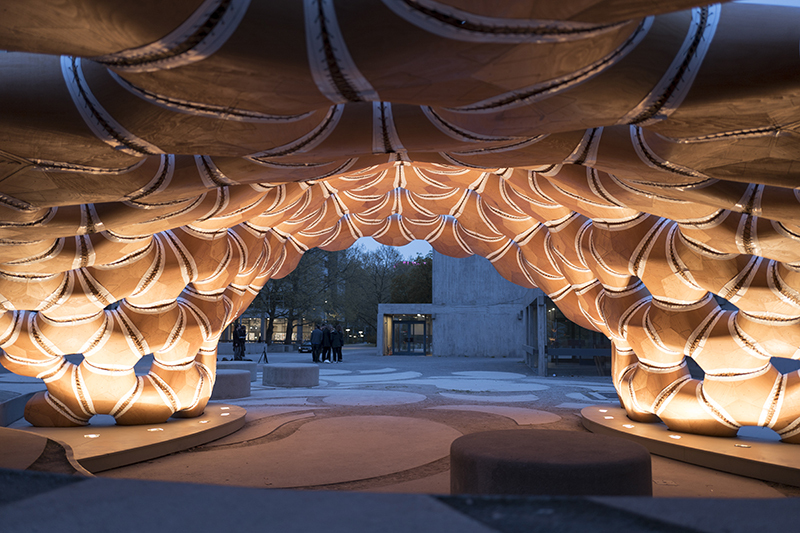 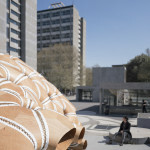 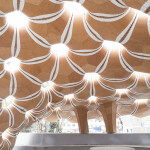 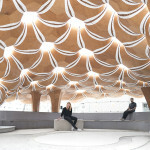 The pavilion was created under the stewardship of Jan Knippers of the ITKE and Achim Menges of the ICD. 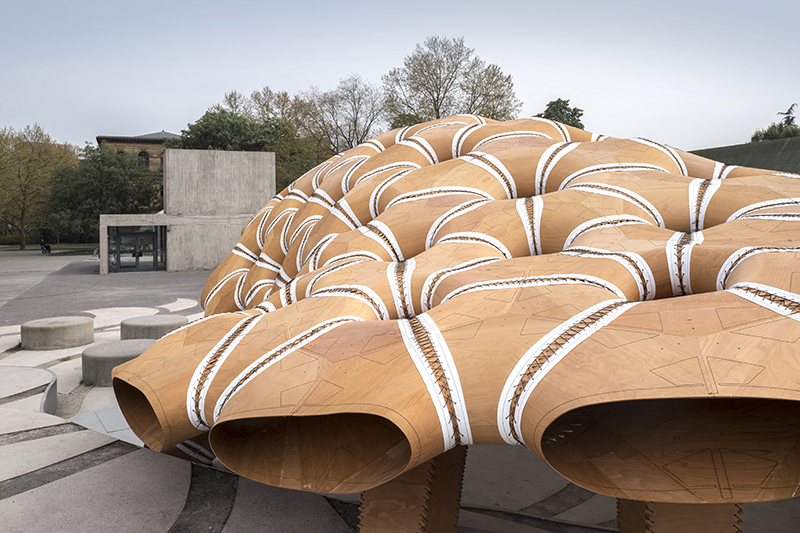 Menges is also working on a very similar project in London, leading the design for the pavilion at London’s V&A Museum which will be built by robots to resemble construction patterns of beetles. 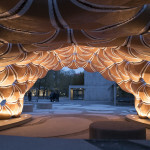 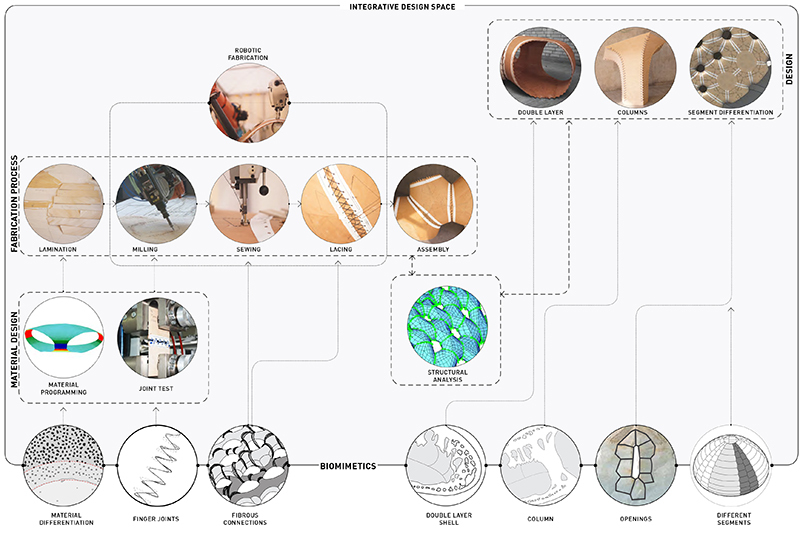 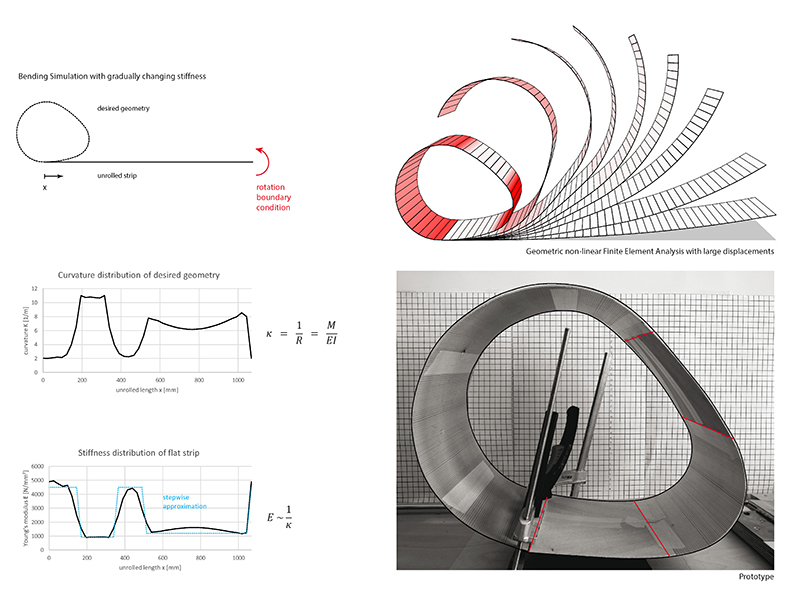 As for Stuttgart’s ICD and ITKE pavilion, the installation is “research pavilions” that will advertise what robotics, computational design, and digital fabrication can do with the realm of architecture. 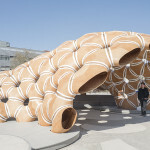 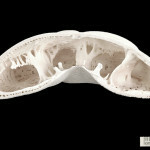 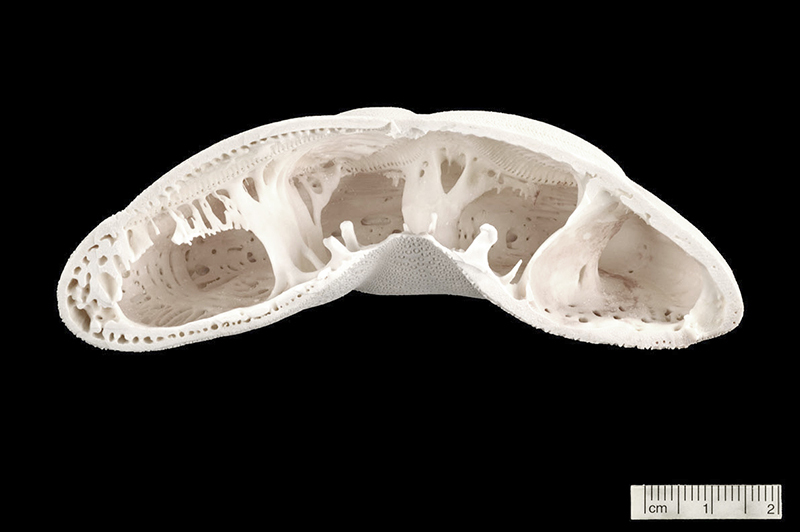 The design team for that pavilion comprised a range of experts including biologists, paleontologists, engineers, and architects. 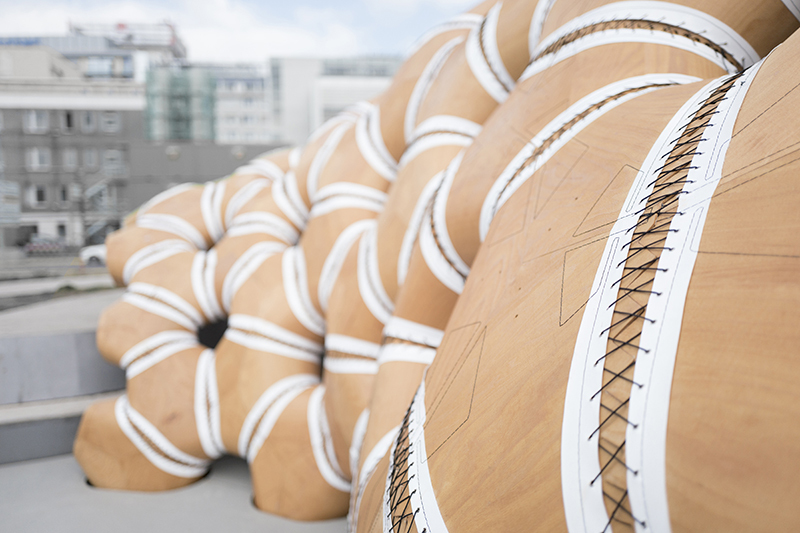 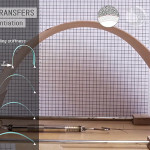 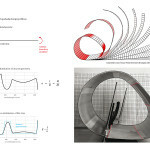 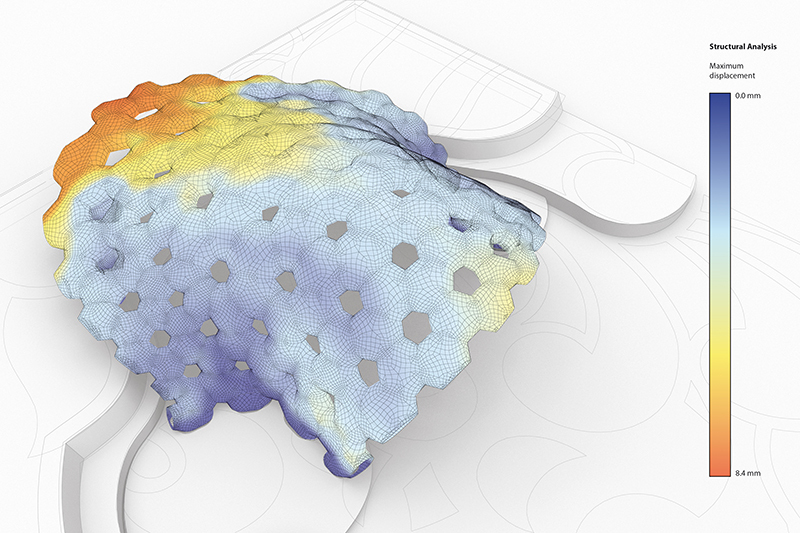 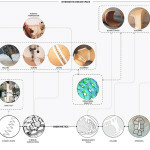 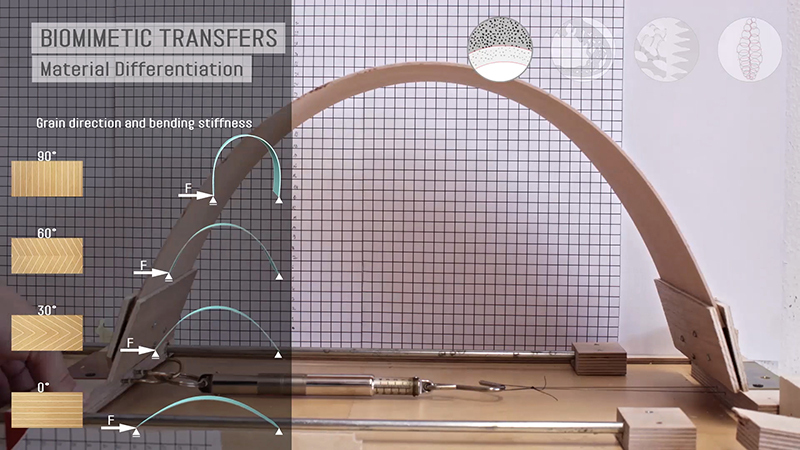 Inspired by “natural segmented plate structures,” the team tested numerous “textile connection methods” but sewing was the best option. 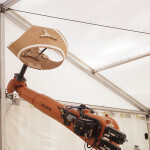 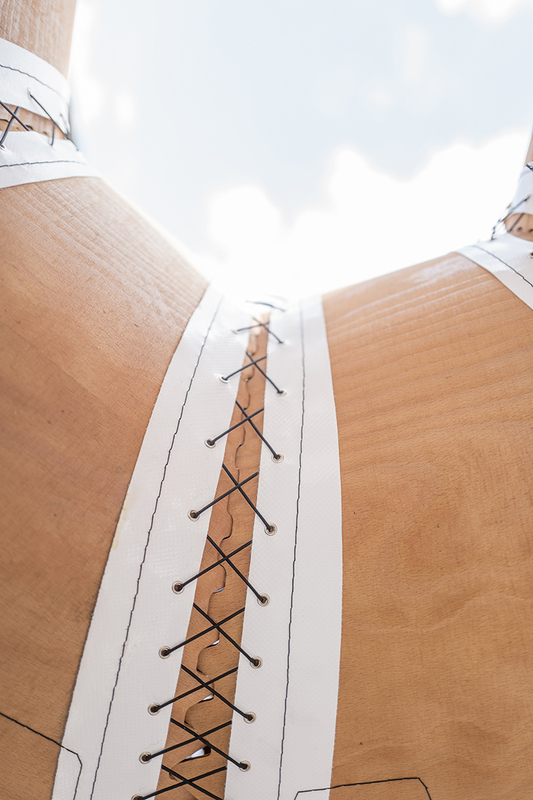 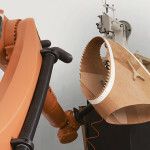 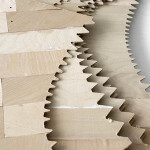 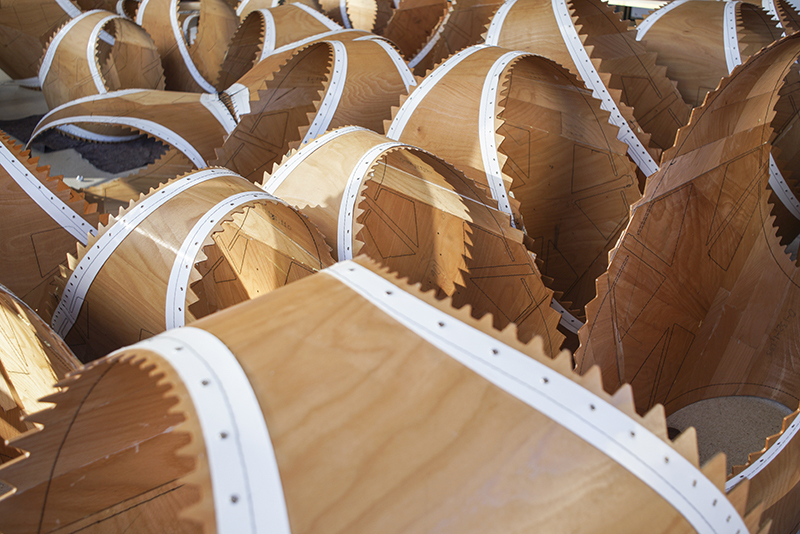 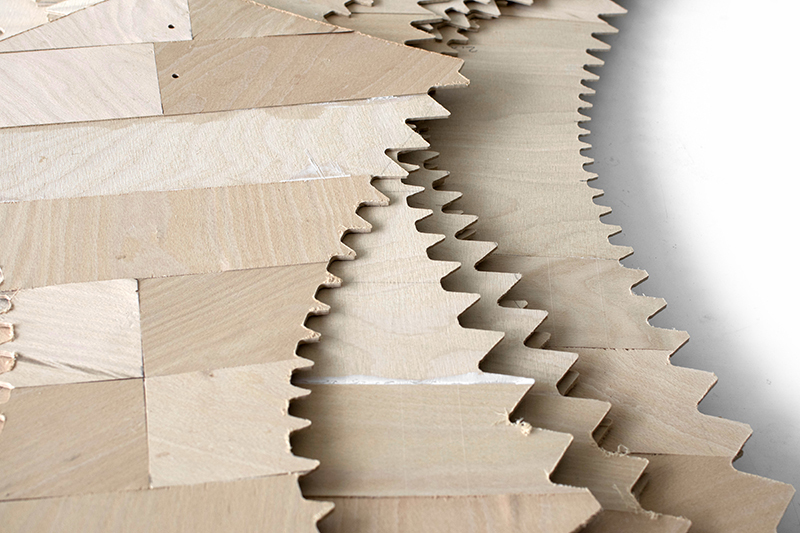 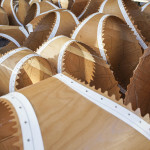 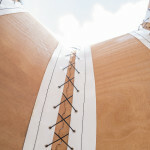 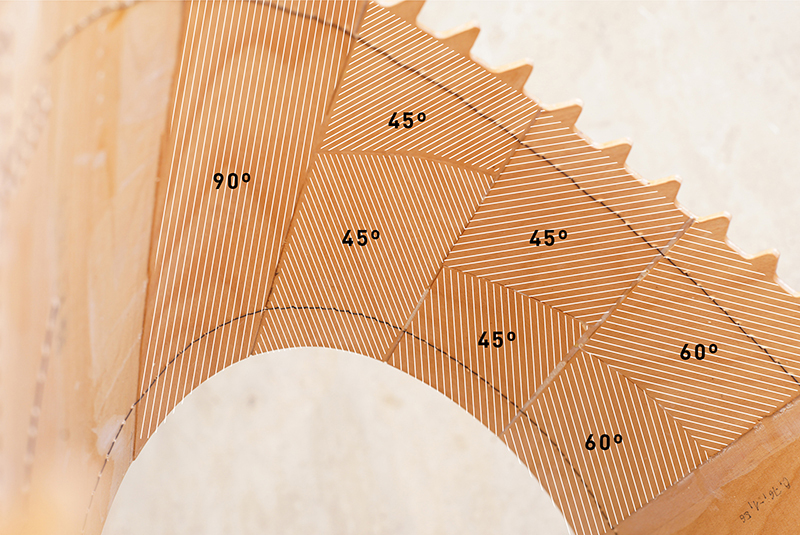 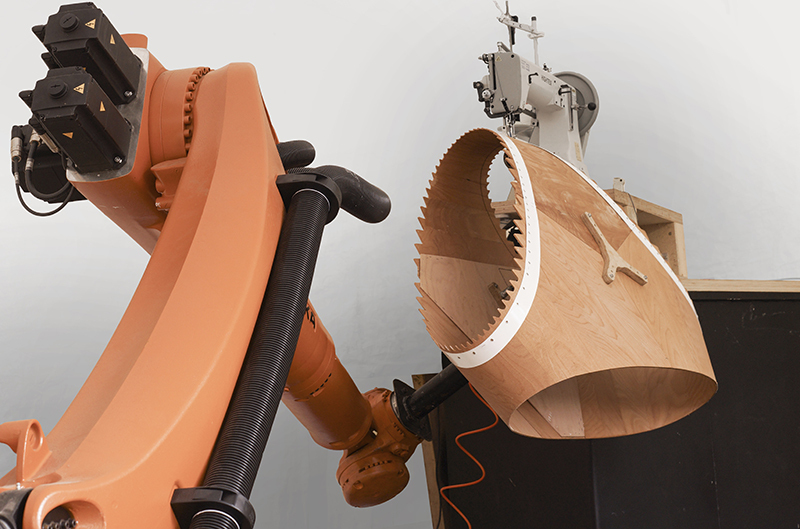 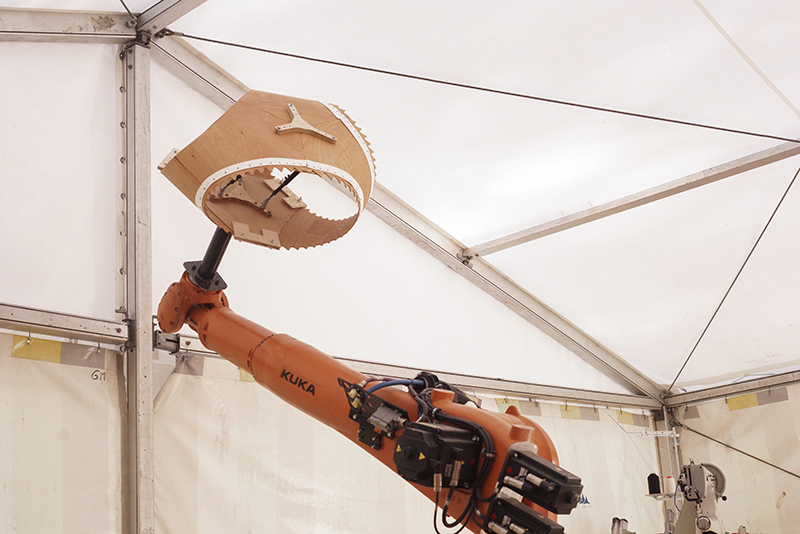 In the final design, robots sewed custom-laminated, specially-flexible beech plywood into double-layered segments.